Impressive mountaintops, pristine glaciers, and adventurous trekking draws travelers to Patagonia: 400,000 square miles that span the southern regions of both Chile and Argentina. This wild wilderness knows no man-made borders, and it can be difficult to decide between visiting Argentine Patagonia or Chilean Patagonia. The great news is that we can combine the highlights of both countries into one fabulous Patagonia region adventure! Two highlights of the southern Patagonia region include Los Glaciares National Park in Argentina, and Torres del Paine National Park in Chile. You can make the most of your time at the “ends of the earth” by focusing on the highlights of the two countries, and linking them smoothly together by an overland transfer. Read on for the highlights of Argentine Patagonia and Chilean Patagonia, how to combine them, and a few extra travel tips. Beginning in Argentina, you fly first to Buenos Aires. A 3-hour flight from this vibrant cosmopolitan capital (and one of my favorite cities in all of South America!) brings you to El Calafate, the main town of southern Argentine Patagonia. Argentina boasts the bigger of the two halves of Patagonia. Unending views of rolling steppe engulf you in a feeling of vastness. The rain-shadow effect of the Andes mountains makes the Calafate region in Argentine Patagonia much drier than its Chilean counterpart. In fact, the Calafate region is only a few millimeters of rain away from being considered a desert. The town of Calafate is nestled on the turquoise-colored Lake Argentino in the Patagonian steppe. It is a launch-pad for explorations of Los Glaciares National Park, and the surrounding area affectionately called “Glacier Country.” Los Glaciares protects parts of the southern icefield, virgin lenga forests, and dozens of glaciers, including the world famous Perito Moreno glacier. A day-visit to Perito Moreno glacier is an incredible way to start your Patagonian adventure. Stand on a large viewing platform just 700 meters away from the face of one of the most active glaciers on the planet. The glacier can advance sometimes up to 2 meters per day. I recommend visiting early in the morning to best avoid the often extensive crowds that turn up by mid-day. The glacier is a bit of a show-off – within just 20 minutes of arriving I heard the crack of ice as pieces of the glacier calved off into the lake below. Cross your fingers for clouds today – the sun can wash-out the dramatic blues and turquoises of the compacted ice. On another branch of the same lake, visiting the lesser known, but still spectacular, Upsala glacier is also a treat if you have another day to spare. My favorite unique experience in Argentine Patagonia is the opportunity to stay at an estancia, the traditional farm of the region. The Argentine gaucho, or cowboy, way of life is an integral part of the Patagonian landscape. Helping shear the sheep, watching the cattle be driven out to pasture, and horseback riding through the river valleys – I can’t get enough! Two of my favorite estancias are located within Los Glaciares National Park – Estancia Cristina and Estancia Nibepo Aike. Both estancias are spectacular places to stay and immerse yourself in Patagonian culture. At the northern part of Los Glaciares National Park is the Fitz Roy massif, where the central rugged peak reaches just over 3,400 meters. This highlight of Argentine Patagonia is best visited from the small town of El Chaltén, an approximately 3-hour drive north from Calafate. If you have time in your travel itinerary, the hiking country of El Chaltén can wow you with views of the Fitz Roy massif, glacial lakes and beautiful vistas. The trails here are well marked and you can easily spend a few days exploring on your own. As Chaltén is a small mountain town, you will need to return to the larger hub of Calafate to continue on to Chile or other destinations. After glaciers, gauchos, and gorgeous views in Argentine Patagonia, continue your adventure to Chilean Patagonia on the other side of the Andes. There are only a few ways to connect the two countries in this remote region. The quickest and easiest way to travel between the two is by an overland crossing, either by private transfer or public bus. Los Glaciares National Park in Argentina and Torres del Paine National Park in Chile are approximately 5-6 hours apart by road. Lodge Transfer Some of the inclusive Patagonia luxury lodges and hotels near Torres del Paine, such as Tierra Patagonia, include the transfer from or to Calafate as part of their all-inclusive packages. Other lodges and hotels, such as Patagonia Camp, charge an additional fee to arrange this service. Lodges that include the transfer pick you up at your hotel in Calafate, and transfer you directly to the lodge. This usually takes about five to six hours, depending on customs at the border. Arranging an overland transfer through a lodge or hotel is an extremely smooth and convenient way to connect the two countries of Patagonia. When choosing lodging, I recommend checking if they include this transfer. Private Transfer Additionally, private transfers can be arranged from Calafate into Torres del Paine National Park. A private transfer allows great flexibility if you have a tight travel schedule. However, independent transfers can be costly, especially if you have a small group size, because of the distance and location in such a remote region. Bus Transfer Public buses run between El Calafate in Argentina and Puerto Natales in Chile, the nearest town to Torres del Paine National Park. This bus ride takes approximately 5-6 hours. There is no public bus that goes from Calafate directly to the National Park. The bus companies Cootra and Turismo Zaahj leave early in the morning from Calafate for Puerto Natales. From Puerto Natales you have to then take another bus ride to the National Park. This is another ride of approximately 2.5 hours. Although buses are the most economical, they are the least convenient way to connect Argentine Patagonia and Chilean Patagonia. Regardless of the type of vehicle, an overland transfer is convenient, comfortable, and the fastest way to connect Chile and Argentina in the southern Patagonia region. There is a smooth road from Calafate that winds through nearly untouched Patagonian Steppe to the Chilean border. To the border is approximately 3.5 hours. At Cancha Carrera, the Argentine border station, you get out to have your passport stamped. About 10 minutes later you exit your vehicle again to enter Chile at Cerro Castillo, the Chilean border station. Here you will get your passport stamped again and your bags scanned. Make sure that you have no fruits, jams, nuts, empanadas or other fresh food with you. These items are not allowed across the border and could result in serious delays to your travel plans. U.S. Citizens do not have to pay a reciprocity fee or entrance fee when traveling to Chile or Argentina. Early morning is the best time to leave Argentine Patagonia to cross the border to Chilean Patagonia. Watch the sunrise over the steppe and eliminate wait time by arriving at the border crossings before most other travelers. On a clear day, you can see the Andes Mountains in the distance, glistening with majestic sunrise hues. With an early morning departure from Argentina, you will also arrive to Torres del Paine in Chile in the early afternoon. This maximizes your time in the National Park, especially if staying at a lodge. Calafate in Argentine Patagonia and Torres del Paine in Chilean Patagonia are only 5 hours apart by vehicle. You can have breakfast in Calafate and by lunchtime be ready to embark on a hike in Torres del Paine National Park. An overland crossing is a beautiful way to experience both Argentine Patagonia and Chilean Patagonia. For those with even more time to explore Patagonia, there are cruises that link Argentine Patagonia and Chilean Patagonia through the fjords around the southern tip of the continent. From Calafate in Argentina, you take a short 1 hour 20 minute flight to Ushuaia, “the southernmost city in the world.” Small-ship expedition cruises, such as Australis, embark from Ushuaia. These cruises cross the fjords and channels around Tierra del Fuego between Ushuaia in Argentina and Punta Arenas in Chile. Routes last between 3 and 7 nights. 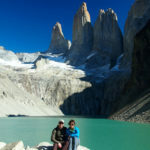 Connecting Argentine Patagonia and Chilean Patagonia via cruise requires more travel time than an overland transfer and is a more costly option. Sailing the same waters as the explorer Ferdinand Magellan is a transformative experience. Chilean Patagonia is generally lusher than Argentine Patagonia, with old-growth forests and more greenery around creeks and streams. Many call Torres del Paine National Park “the crown jewel of Patagonia.” Turquoise lakes are silhouetted by granite peaks, glaciers hang in pristine valleys, and crystal clear rivers crisscross expansive hiking trails. I recommend no less than 4 nights in this natural paradise. Take advantage of the extensive and well-maintained trail infrastructure to see Patagonia region highlights throughout the east, central, and western parts of the national park. The main areas of the park are focused around the ‘W’ hiking route, named as such because of the ‘W’ shape of the trail. Departing from Torres del Paine, the penguins of Magdalena Island just might be the cherry-on-top of Chilean Patagonia. The centerpiece of the national park is the awe-inspiring Paine Towers. The four-hour ascent to the glacial lake nestled just in front of these soaring peaks is the park’s most iconic hike. Though strenuous, I find that taking many short breaks rather than just a few long breaks will help you catch your breath, while not stopping your momentum. Climbing over the last bit of glacial moraine and witnessing the towers come into view, is literally breath-taking. The Grey Glacier shines with blues and turquoises that Crayola will never be able to replicate. Explore the glacier in different ways depending on your preferences. Visit the nearby shores with a light hike, take a boat/kayak up to the face of the glacier, or ice-hike on top of the surface. I plan a visit to Grey Glacier early in my time in Torres del Paine. Weather dramatically affects these particular excursions so I like having the option to reschedule. The different ways to experience this natural wonder makes Grey Glacier one of my favorite sites in the park. The French Valley offers incredible views of granite landscapes, snow-capped Los Cuernos and Paine Grande mountains, and glacial lakes. This section of the ‘W’ trek in the central part of the park is one of the most difficult to reach because there is no road access. This is truly an off-the-beaten-path experience. Mountains embracing you from all sides is an effect both humbling and spectacular. Many experienced park guides say this is their favorite hike of the park. Although you began your adventure in Argentine Patagonia, to leave Chilean Patagonia it is best to go through Punta Arenas in Chile rather than crossing back through Argentina. Many flights leave from Punta Arenas, an approximately 4-hour drive south of Torres del Paine National Park. Although there is a small airport in the closer city of Puerto Natales, commercial airlines rarely service this location. Getting to and from Patagonia is easily arranged through safe and local airline carriers who have several daily flights. If you have an extra morning before leaving Patagonia, I wouldn’t miss a visit to Magdalena Island’s Natural Penguin Monument. Just a few hours from Punta Arenas by boat, over 100,000 penguins call Magdalena Island home from November through January. Walk the trail through their penguin colonies and come within inches of the curious creatures before catching a late afternoon flight to your next travel destination. Combining Argentine Patagonia and Chilean Patagonia into one adventure highlights the distinct culture and dramatic landscapes of each country. You can begin at Los Glaciares National Park in Argentina and then head to Torres del Paine National Park in Chile, as exemplified above, or you can also reverse the order to begin in Chile and end in Argentina. In either direction, the wonders of the region are inspiring. This combination of Argentine Patagonia and Chilean Patagonia can be found as part of our sample Argentina + Chile Adventure itinerary. Cross the border to interact with two distinct cultures and see twice as many majestic landscapes of Patagonia. Two cultures, two countries, one beautiful Patagonia. Has Patagonia caught your attention? To plan your own custom South America itinerary to Argentine Patagonia, Chilean Patagonia, or both, give us a call today at 612-315-2894 or send us an email. Our Patagonia Trip Specialists are ready to help plan your next adventure!